A/C systems are split into two sides, the low pressure side and the high pressure side. The two points that separate the sides are the compressor’s reed valves and the expansion valve at the evaporator. If we start at the compressor this is a pump and like most pumps it has a pressure side and a suction side. The suction side of the A/C system pulls refrigerant in gas form, refrigerant that has stored enormous amounts of latent heat. The refrigerant exits the compressor at high pressure and proceeds to the condenser. Oil that lubricates the compressor is carried in suspension with the refrigerant and circulates through the system. 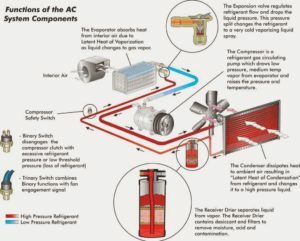 The condenser is really just a big heat exchanger a device mounted in the air stream usually in front of vehicles radiator. It can transfer heat stored in the refrigerant to the air moving over the coils and fins. The combination of high pressure and heat loss that occurs in the condenser means the refrigerant is converted from a gas to a more than 90% liquid / gas mix when the system is working properly. Separate the refrigerant liquid from a mix of vapor and liquid. Filter the refrigerant for residual solids. Remove moisture from the system. Store the reserve liquid refrigerant for surge conditions. As the refrigerant pours into the receiver / drier, the liquid goes to the bottom of the canister and the gas rises to the top. Refrigerant leaving the receiver / drier must move out through a tube that extends almost to the bottom of the canister. In a properly charged system this assures that only liquid refrigerant will leave the receiver / drier. Refrigerant must be kept extremely clean and dry so most receiver / driers contain both a filter and a desiccant to absorb impurities and moisture as the refrigerant flows through the system. When the refrigerant leaves the receiver / drier it has been pressurised by the compressor, cooled and converted into mostly liquid by the condenser and separated into pure liquid refrigerant by the receiver / drier. This high pressure liquid refrigerant moves next to the expansion valve. The expansion valve is one of the two separators between high pressure and low pressure in the A/C system. Though different types of valve may be used, you can think of the expansion valve as a very small orifice with high pressure on one side and low pressure, liquid droplets rapidly changing to a gas on the downstream side. The expansion valve is located on the inlet side of the evaporator. As the high pressure liquid refrigerant moves through the expansion valve, the pressure drops and the refrigerant moving into the evaporator starts to vaporize. When a material changes from a liquid to a gas, a tremendous amount of heat is absorbed. The evaporator is another small heat exchanger and looks like a small radiator. The refrigerant moves through the tubes while an electric fan moves cabin air across the multiple fins that surround the tubes. As the refrigerant, now at low pressure, moves through the tubes, warm air is constantly moving over the fins causing the refrigerant to continue vaporizing and to continue absorbing heat from the ambient air. Because cool air carries less moisture than hot air, the evaporator functions as a dehumidifier as well. Moisture that collects on the fins of the evaporator is collected in a tray in the bottom of the evaporator housing and runs through a tube and exits the car. tube, working through a diaphragm attached to the valve itself, can open or close the valve to control the temperature. Low pressure refrigerant leaving the evaporator travels to the suctions side of the compressor completing the cycle and to start the process again.